This well-preserved medieval town is located in northwest Spain in the region of Galicia. 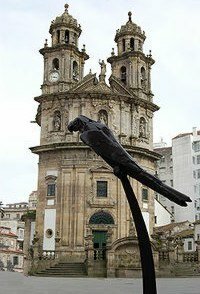 Situated amongst the winding curves of the Lerez River, although it may not be on the same grand scale as Santiago de Compostela, it still attracts many visitors each year because of its rich historical and cultural heritage. Most of Pontevedra is quite flat, with is a gentle uphill climb towards the old district. This part of town is not only the most interesting, but also where the best nightlife is found. Pontevedra has an abundance of squares all of which are filled with lively bars and cafes. A local market is held each week at the Alameda, which is the town square. The main Plazas are the Teucro and Ferreria both of which link to many of the smaller streets. One rather special little square however, is the picturesque Plaza de la Lena, surrounded by 18th century houses. If you are interested in historical architecture, there are several beautiful palaces and churches to explore. Inside the 16th century Church of Santa Maria la Mayor is a mixture of styles ranging from Gothic to Renaissance. The Capilla de la Peregrina was built much later in the late 18th Century, and has a rather unusual facade in the shape of a shell containing the image of the town’s patron saint. For a typical example of the Mendicant Order, next to the gardens of the Plaza de la Herreria is the impressive Convent of San Francisco. The Provincial Museum in the most significant in Pontevedra. It has a collection of 15th century paintings by early Aragon artists, as well as Celtic treasures dating from 2BC to 1AD. There is also a lapidary museum in the Gothic church of Santo Domingo, which is the resting place for several important noblemen. Spain has always been famous for its festivals and there are several held in Pontevedra throughout the year. Shrove Tuesday is celebrated with a Carnival and in August you can enjoy the Peregrina Festival which often includes some bull fights. Or there are more religious events such as the pilgrimage of San Benitino de Lerez in July, and the Feast of Santiaguino del Burgo. If swimming or sunbathing is on your agenda, you are never far from a lovely beach. The Bueu, A Lanzada and Sanxenxo beaches also have various beach sports including sailing and surfing. There are other activities in the surrounding area to enjoy as well such as golf, horseback riding, a visit to the local Aquarium, or if you make your way to O Grove you can even experience a submarine dive. Otherwise there is the cosmopolitan town of Vigo, surrounded by a ria which is a coastal valley submerged under the sea. Pontevedra has many excellent hotels but if you are after a more unique experience, the former home of the Counts of Maceda offers just that. 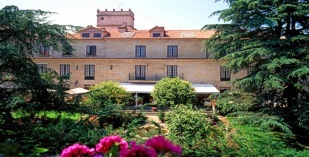 This 16th century palace is now the Parador Pontevedra (Hotel Casa del Baron) and is located in the old district. The hotel is not only extremely elegant, but also has a restaurant that serves wonderful regional dishes accompanied by excellent local wines.